Combined Cycle Power Plants are in wide demand throughout the world, because they are characterized by short construction times, low investment costs, high operating efficiencies and low exhaust emissions. This type of power plants can reach fuel to electricity conversion efficiencies of 60%, at the same time it has minimal environmental impacts. The most important reason for this is the use of natural gas, which is a very clean fuel containing little or no sulfur, particulate matter and other unwanted ingredients. This study was investigated the effect of cooling water from natural gas combined power plant to Black Sea region of Turkey. The parameters, which affect the marine ecosystem, were determined and in addition temperature, suspended solid, COD values were measured. Modelling of these measured values was performed throughout discharge line with the CORMIX-2 software developed by EPA (Environmental Protection Agency) as environmentally purpose. I. S. Ondryas, D. A. Wilson, M. Kawamoto and G. L. Haub “Options in gas turbine power augmentation using inlet air chilling”, Trans ASME Journal of Engineering for Gas Turbines and Power, vol.113, issue 2, pp. 203-211, April 1991. Kehlhofer, R., Combined Cycle Gas & Steam Turbine Power Plants, 3rd ed.,Penwell Publishing Company, Oklahama, USA, 1997. Akturk, “Heavy metals ın sedıments of the black sea,” In. Eng. Master of Science, Bogazici Institute of Environmental Science, Istanbul, Turkey, 2005. Doneker R. L. And Jirka H. G. “CORMIX-GI systems for mixing zone analysis of brine wastewater disposal” Desalination, vol. 139, issue 1-3, pp. 263-274, Sep. 2001. L.R. Davis, Fundamentals of Environmental Discharge Modeling. CRC Mechanical Engineering Series, Boca Raton, CRC Press, 1999. D.J. Baumgartner, W.E. Frick and P.J. Roberts, Dilution Models for Effluent Discharges, 3rd ed., USEPA, Newport, OR, 1994. ISNAD AYERI, Tolga . "Deep Sea Outfall of Natural Gas Fired Combined Cycle Power Plant Cooling Water Application and Modeling". 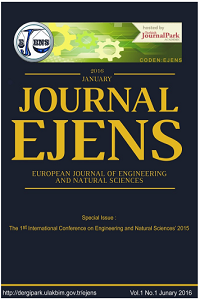 European Journal of Engineering and Natural Sciences 2 / 1 (February 2017): 64-69.